The White Princess ended its limited series run with “Old Curses”! With the future of the Tudor line in question, Henry and Lizzie must do whatever necessary to secure their reign. The finale opens with a dream sequence of Lizzie walking down a hallway in the castle. She turns a corner and sees The Boy (Richard?) on the throne. As she moves closer, blood runs across the floor, and soon, her nightgown is drenched in Tudor blood. 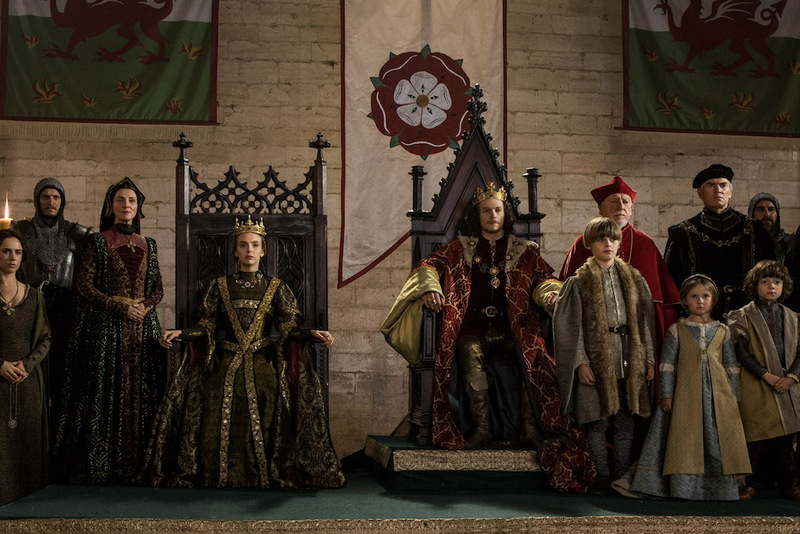 Lizzie looks above the throne and sees her son’s heads and Henry’s on pikes while Richard smiles from the throne. Meanwhile, Maggie’s been very busy. She takes Cathy Gordon to where the Duchess of Burgundy is hiding out in London. Cathy pleads for the Duchess to find her baby, and the Duchess diverts her by telling her to write her Uncle, King James of Scotland, to gather an army so they can defeat the Tudors. Maggie, in a moment of fire, tells them that they must strike now, and the Duchess approaches her. Maggie insists that Cathy Gordon stay there with them. 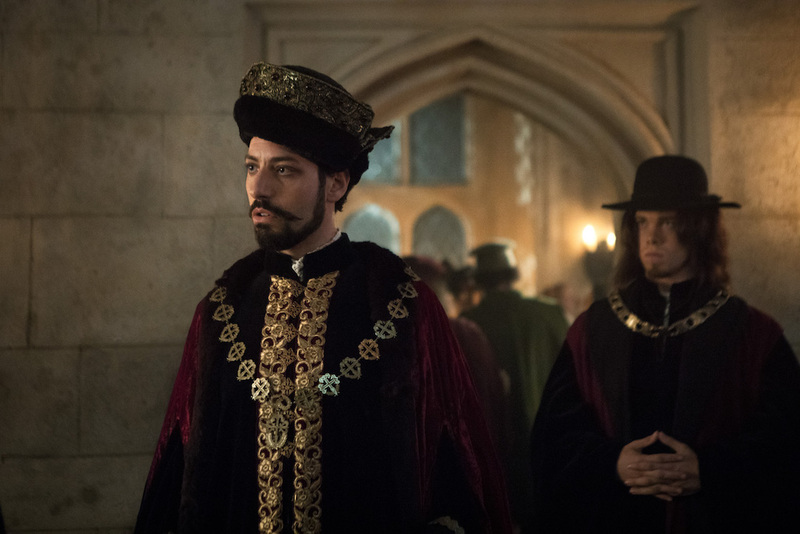 At Westminster, Lizzie walks into the meeting room as Henry learns that the Spanish Ambassador isn’t happy because The Boy and the Earl of Warwick are still alive…and that Lizzie knew what was necessary all along. Lizzie doesn’t want them dead, though, and that’s when she confesses that she set the fire in the King’s wardrobe. Henry orders everyone out, even Lady Margaret, and asks Lizzie why she would do something like that? Then she reveals a secret she has kept from Henry for many, many years. Whoever was responsible for their deaths, would see their male lines die off. This causes Henry to pause, and Lizzie explains that they must let The Boy live because he is Richard, her long-lost brother. If he dies, then one of their sons will die as well. Outside, Lizzie watches as Arthur and Harry practice their archery, and she’s approached by the Spanish Ambassador. He has a message to her from Queen Isabel, from one mother to another. The fact that she hasn’t killed the York threats makes her think that she’s not serious about a union between their children. Lizzie assures him that she has the matter in hand. At the Tower, Henry has a look at Richard. He then tells the guards to move him into the same room as the Earl of Warwick. The Bishop and one of his apprentices speak with Lizzie about Scotland preparing to ride against England, along with a group from Burgundy and Ireland. They’re going to back Richard. 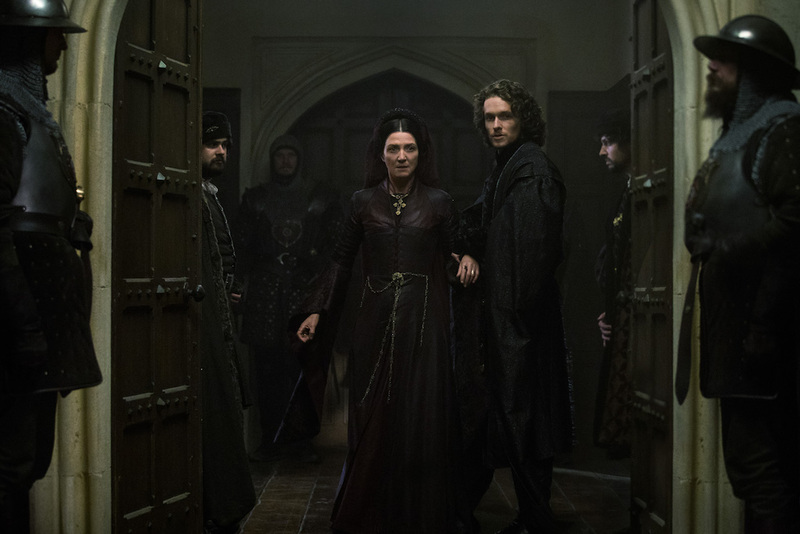 Lizzie tells the Bishop to go speak with Lady Margaret and she tells his apprentice to follow her. Their plan is soon revealed. Lizzie and this man go to a prison and find someone who looks similar to Richard. Lizzie tells the helper to tutor him and make it perfect. She’s taking a page from her mother’s notebook and creating her own imposter. Lady Margaret is summoned to Henry’s chambers and she doesn’t wait to lay into him. Henry tells his mother that he called upon her because he faces a very difficult decision and he wants to be counseled by her when it comes to killing the York men. Lady Margaret knows she’s been found out. She tells him there are things necessary for the greater good, things that must be done. Now, he should be resolved to kill the boys. He tells her about the curse, and she doesn’t believe in curses. He tries to strangle his mother then drags her from the room. He throws her in front of the court members outside his chamber. Maggie goes to the Tower with a basket of treats for Teddy. 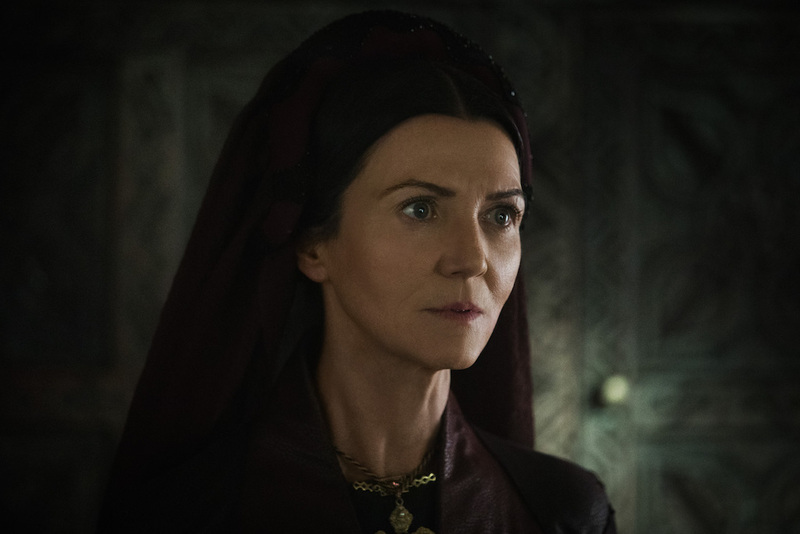 While he’s engaged with his fresh bread, Maggie tells Richard that armies march for him and they’ll carry him from the Tower on their shoulders. He tells her. They watch Teddy as he sits happily, and Richard asks him what he wants when they get out of the Tower. Teddy wants a friendly dog, and Richard promises him a hundred dogs when they’re finally free. Lizze and Henry are together, and he tells her that his mother was responsible for the deaths of the York boys, or at least one of them. Henry is going through a major crisis of concious as he realizes the crown he wears was stolen from the rightful rules. Lizzie tells him that they can still fix it and takes him to see the prisoner she has spared. The man was set to be publically whipped and hanged, but he’ll settle for a simple hanging and some money sent to his wife. Henry tells her that he won’t sanction this and she begs him to reconsider. Henry knows his days are numbered and he wants to make sure that Lizzie and their children are safe after he dies. In her chambers, Lady Margaret gets out of bed and trips over some clothes left on the floor. Lord Stanley comes in and helps her up. It’s then she realizes that her ladies are gone and there’s no one there to help her dress. Then after he helps her put on her robe, he asks her if she feels her power over things going away. Maggie is back over at the Duchess of Burgundy’s hideout. She’s telling that Henry is losing his mind and Lizzie’s doing what she usually does. Cathy comes in with a letter from King James, and she tells Maggie that when she’s on the throne that Margaret Beaufort will pay for taking her son from her, and that the Duchess hasn’t gotten word of where her son has been placed. The Duchess shares a look with Maggie that tells her to keep her mouth shut. They both know that the baby is dead. After reading the letter, they are aware that two thousands troops wait to sail across from Burgundy to back Richard’s claim. As Maggie starts to leave, the Duchess points out that her husband, Richard Poole, is loyal to the Tudors. The look the Duchess shoots him is all the answer we need. If Richard takes the throne, Richard Poole will not live long. At the castle, Lady Margaret approaches Lizzie and asks her to tell Henry that there’s no curse. At that moment, Lizzie stops caring completely and confronts Margaret about her sins. Lady Margaret tries to make a cut about Lizzie always having a plan, and Lizzie tells her that she’s never had a plan. That even know she must broker the safety of her children because of the chaos Lady Margaret has unleashed. As Lizzie walks away, Lady Margaret makes a final plea, telling her that if she’s not stunned by the horrible things she would do for her children then she’s not a woman worthy of the name. That night, Lizzie checks on her boys and Arthur wakes up. He asks his mother if they’re going to be sent to the Tower, and she tells him no. Harry lies awake on the other bed the whole time, listening. The next day, Henry and Lizzie go through the portion of the castle that was set on fire. He tells her that the smell reminds him of Bosworth. He then asks Lizzie if she knows how her uncle really died. He goes on to explain, in detail, all the horrible things he let his men do to Henry before they finally buried him alive. They wake up in the morning above everyone else, but by the time night falls, they’re degraded beyond anything. Lizzie, who has to deal with all the information about her former lovers death, pulls it together and tells Henry that peace is hard fought, and they’re about to fight for it again. Henry ignores her words and asks if she went to the Tower. Henry’s appearance is haggard and worn. He looks utterly defeated as Lizzie reminds him that the Tudor lords won’t stop fighting for the throne, even if he dies. Maggie tries to leave her home because she hears that they’ll be publicly hanging Richard, and she can’t believe Lizzie would kill her own brother. Her husband, Richard, stops her and tells her that she can’t go. There will be spies there and she can’t risk being seen. Then he comes right out and asks if she’s been carrying messages. Maggie tells him that she’s been biddable. She’s done everything they’ve asked, married who they told her, but she’s done being biddable. She does clarify that she’s grateful for the man that he is, and she doesn’t regret marrying him, which is nice. He then tells Maggie she must promise to stop carrying messages and lie low. If she’s caught, it will ruin them all. In the crowd at the hanging are the Bishop’s helper and Lady Margaret, watching to see if they believe the hanging. Also, the Duchess of Burgundy and Francis Lovell are there with several men to swoop in and save Richard at the last minute. When they realize it’s not him, they pull back. After the imposter is hung, people rush forward to pull him down harder against the noose. At court, everyone is celebrating and Henry tells Lizzie that everyone believes it. They’re all happy and dancing. During all of this, Maggie has gone to the Duchess of Burgundy and runs a letter to the Spanish Ambassador from the Duchess, explaining that Richard still lives and the man they hung was an imposter. As she leaves the Duchess, the Bishop’s helper spies her running away. The helper shows up and nods to Lizzie who meets him in the hallway. He tells her that the Duchess of Burgundy is in London and has help from inside the court. The Spanish Ambassador approaches Lizzie, too. They tell Lizzie that she has one night to fix the problem or they’ll leave. In bed that night, Lizzie tells Henry that he has to kill Richard and Teddy. There’s no way they can let them live. Lizzie tells him that her aunt, the Duchess of Burgundy, won’t stop until a York is on the throne, and they need to get rid of the Yorks. That night there’s a raid on the Duchess’ hideout and Maggie is thrown in the Tower. Lizzie and the Bishop go and visit Teddy. They ask him what he and Richard talked about when they shared a room. Teddy responds that Richard promised him friendly dogs. A hundred. They ask Teddy if he can sign his name, and he tells them he can. He writes his name at the bottom of a blank piece of paper, and his fate is sealed. Teddy is the saddest case in all this. His life has been lived in exile and alone. He’s simple and soft-hearted. It’s a tragedy. By the time they present the document to Henry, the blank part has been filled in with a fake confession. The Tower bells ring and Maggie knows something isn’t right. They try and take Teddy from the room, but Richard tells them that they’ll go together. Once they reach the execution stand, Teddy starts to cry and pull back, but Richard coaxes him on. Teddy cries and is scared, but Richard kneels beside him and holds his hand as he’s executed. When they move Teddy’s body, Richard looks at Lizzie, the only person there to witness their deaths. Then he’s executed as Lizzie watches. The York threat is gone. I’m not sure if Lizzie is asking Richard or their mother. Maggie is led into an empty room in the Tower and Lizzie comes in to speak with her. It’s not a friendly conversation, and Maggie and Lizzie’s closeness is finished. “The Earl of Warwick was executed for treason this morning. My aunt is returning to Burgundy where she will live a life of sober contemplation. Cathy Gordon is in the palace. She will become a permanent member of my household and I will care for her. After she uses the SAME words that Lady Margaret spewed earlier when asking Lizzie to tell Henry the curse didn’t exist, Lizzie has adopting the persona of Queen. She’s willing to stand by her decisions and possibly make herself beleive those words to be true. She leaves Maggie, sobbing, in the Tower. In their chambers, Lizzie and Henry are dressed in their royal attire, but Henry’s crown is still off. Lizzie picks the crown up and Henry kneels. She places the crown on his head. The passes on the crown from York to Tudor is very symbolic as Henry has been given the right to rule from the very family he “stole” it from. As they walk into court, Lizzie whispers from him to greet his mother, which he does. Henry stops at the young man who has been helping them and is the assistant of the Bishop. He asks his name. Then he places him as the tutor of Prince Harry, and all history buffs simultaneously scream NOOOOOOOOOO! Wolsey is invited to stand beside the thrones. Once everyone is in place, Henry announces the betrothal of Arthur to Katherine of Aragon. In the end, the Tudors reign is secured, but at what personal cost? And how will these decisions resonant in the future? The finale of this limited series wrapped up all the loose ends that we had been wondering about. 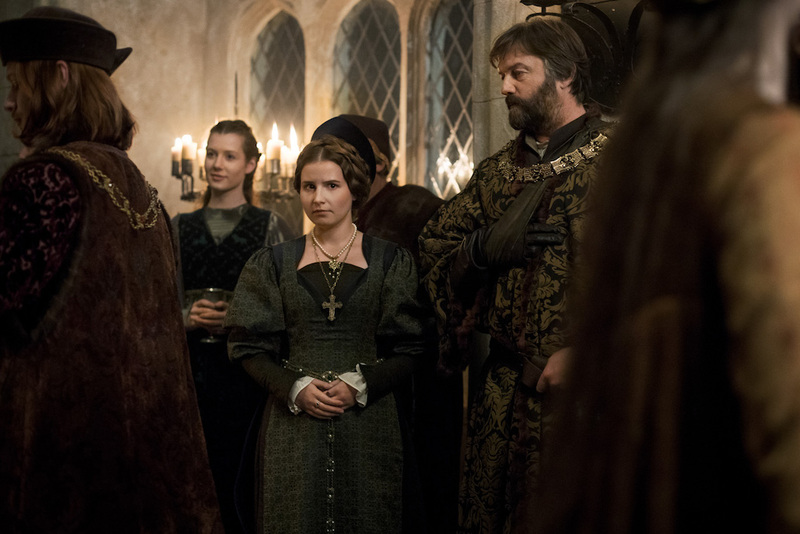 Now the question on our minds is if the next novel, The Constant Princess by Philippa Gregory, which follows Katherine of Aragon will make it to the small screen! What are you thoughts on this season of The White Princess? Did “Old Curses” bring it all together for you? Thank you for keeping up with the series with us and live tweeting each Sunday night! We had a blast!